People who work in accounting record, analyze, and maintain financial accounts. They might work for the government, a large company, or a small business. 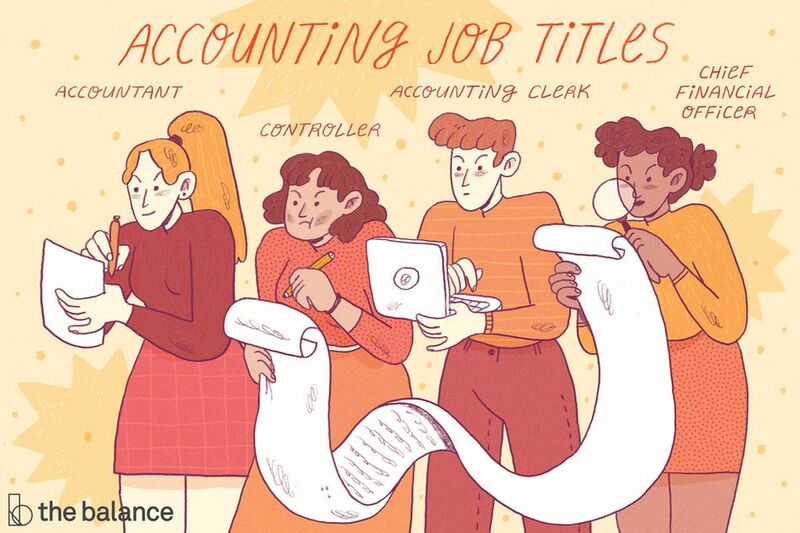 Because accounting is such a broad field, there are many accounting job titles. Read below for a list of some of the most common accounting job titles, as well as a longer list of accounting job titles. Use these lists when searching for a job in accounting. You might also use this list to encourage your employer to change the title of your position to fit your responsibilities. However, keep in mind that many accounting jobs require specific certifications and licenses, and these often affect one’s job title. Below is a list of some of the most common accounting job titles, as well as a description of each. For more information about each job title, check out the Bureau of Labor Statistics’ Occupational Outlook Handbook. An accounting clerk produces and maintains financial records for a company. He or she might enter financial information into computer software, check this data for accuracy, and/or produce reports on this information. Also known as a bookkeeping clerks or auditing clerks, they work in almost all industries. Below is an extensive list of accounting job titles, including those described above. More information on job titles and job titles for a variety of occupations. Sample job titles and job title lists categorized by industry, type of job, occupation, career field, and position level.